Ash-Greninja has powered up thanks to the strength of its bonds with Ash. This is the form Greninja takes when it has gained new power due to the miraculous occurrence known as the bond phenomenon. This can be brought on by the bonds between people and Pokémon. It seems that it has only been known to have occurred once—several hundred years ago. 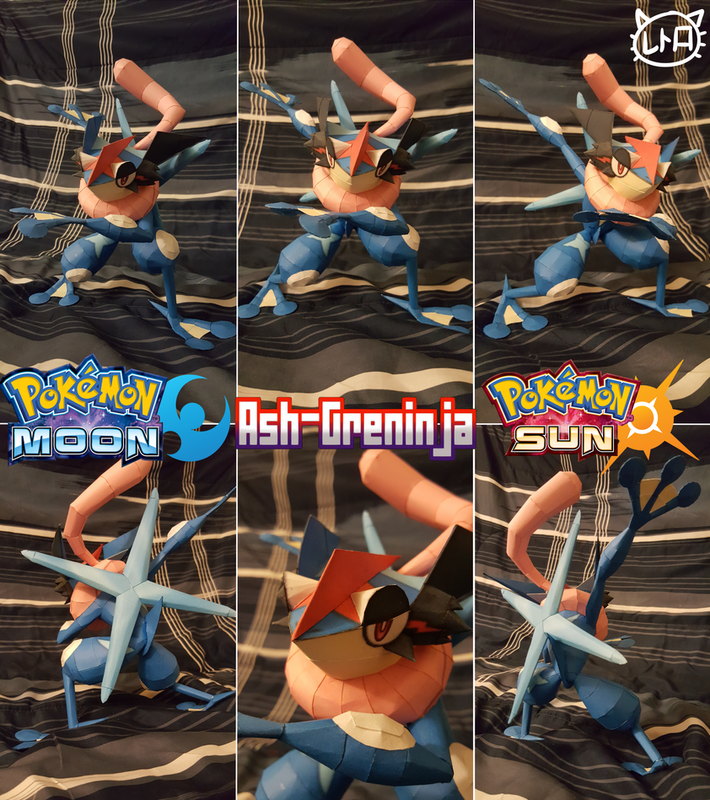 Ash-Greninja's leg strength has been enhanced compared to an ordinary Greninja, making it difficult to see because of the speed at which it can move. It takes its enemies out in a flash! It becomes able to make giant Water Shurikens on its back, and it can throw them in rapid succession. Greninja that can become Ash-Greninja have an Ability that no Pokémon has ever had before—Battle Bond. The Battle Bond Ability triggers this Pokémon’s form change to Ash-Greninja after it causes an opponent’s Pokémon to faint. When the battle ends, the Pokémon returns to its original Greninja form. This form is only for battles where it needs to break the limits! Build Order: Just follow the video :D . For additional information open .pdo file with Pepakura VIEWER. Notes: Ash-Greninja was built by SuperRetroBro. Thanks for building! The .pdo file included in the package has no textures, and is to be used in Pepakura Viewer only!